Will you crack the codes or crack under pressure? Cryptography experts want you for undercover code-breaking in a grown-up game of encryption and espionage. Crack The Code was first commissioned by the Dana Centre for an event in March 2007 to bring the complex science of cryptography to an adult audience in engaging fashion, supporting a Science Museum exhibition on Spying. A revival was commissioned in October 2012, supporting an exhibition on Alan Turing, and sponsored by VISA. 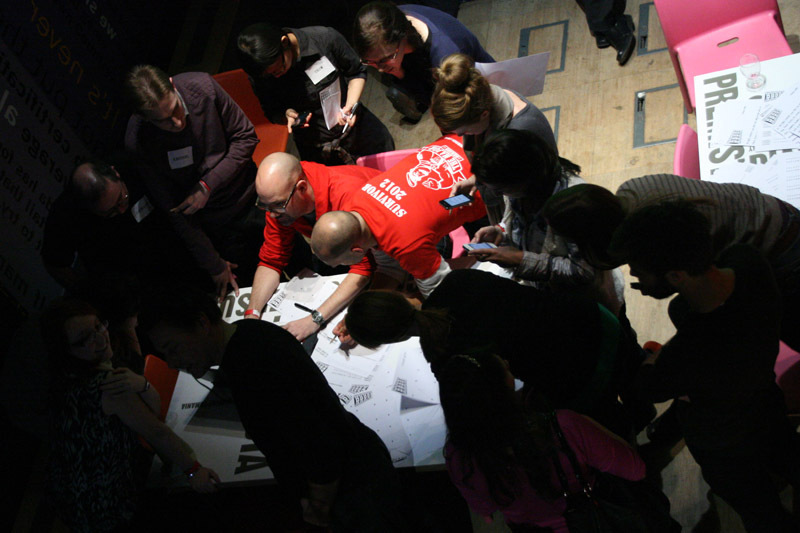 Crack The Code is a game of codebreaking, where audience are divided into four big teams and take on challenges to break different styles of code. Teams score points for cracking their challenge first, for cracking the challenge of their rival team before they do, or outing the enemy moles on their team. Each challenge is introduced by an expert in the field. Professor Richard Walton, former director of CESG at GCHQ, spoke in both 2007 and 2012 events on crafty types of columnar transposition, joined by Brian Clegg in 2007 speaking about quantum cryptography, and Rohan Mehra in 2012 speaking on Turing and cracking Enigma. And on both occasions, a hacker turned software consultant called Richard Barton stood in for his grandmother, Joan Barton, herself a veteran of Bletchley Park. But that Joan seen on camera and Richard were played by actors, as part of a twisting tale of industrial espionage and ethics, into which players could dig. The tale started in the online tutorial for basic cryptography that players could take in advance of the event, and culminated in a twist at the very end of the event. Joan Barton was played on camera by Muriel Coe, who was herself a veteran of Bletchley Park, and was the grandmother of Sam Bailey in the original team. Something of the online tutorial remains online here.